› Author AffiliationsWe thank NSERC (DG, CRC and USRA programs), the Canada Foundation for Innovation (Project Number 35261), the Ontario Research Fund and the University of Toronto for financial support of this work. L.R.M. thanks the province of Ontario for a graduate scholarship (OGS). Since their discovery, metal homoenolates have been widely explored as carbon-based nucleophiles for the β-functionalization of carbonyl derivatives. 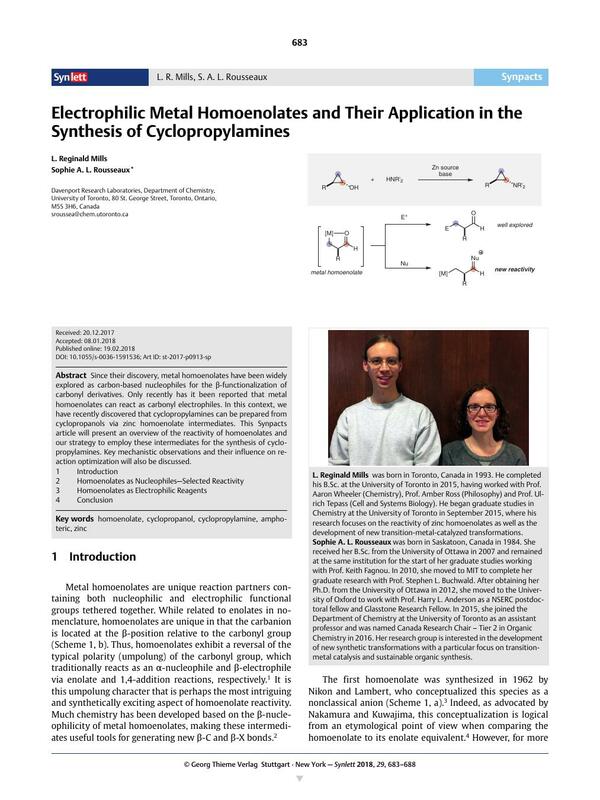 Only recently has it been reported that metal ­homoenolates can react as carbonyl electrophiles. In this context, we have recently discovered that cyclopropylamines can be prepared from cyclopropanols via zinc homoenolate intermediates. This Synpacts ­article will present an overview of the reactivity of homoenolates and our strategy to employ these intermediates for the synthesis of cyclopropylamines. Key mechanistic observations and their influence on reaction optimization will also be discussed. 9e Molander GA. Jean-Gérard L. J. Org. Chem. 2009; 74: 1297 and references therein. 20 See ref. 19 and references therein. 22 The proposed iminium intermediate is extremely short-lived and we have not been able to directly observe it. However, if the reaction is performed with a primary amine, the protonated homoenamide is detected upon aqueous quench as the corresponding imine. 25 The direction of cyclopropanol ring-opening has been well studied and happens toward the carbon that best stabilizes the partial negative charge: DePuy C. H. Acc. Chem. Res. 1968, 1, 33 see also ref. 6a and references therein.